Distinctively different, the plant has delicate, finely divided leaves often a blue-green in colour. The stem can be shades of purple. The white flowers, more like starbursts, are made up of stamens. 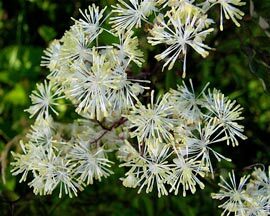 Tall Meadow Rue flowers do not have any petals. Literature often states that this plant needs to be in the shade, but we have found it grows well in full sun if watered. Plant is very adaptable in restorations. Plant is very wind tolerant.